How to Convert HD videos to SD on Mac? More info you can visit: Mac convert HD videos to SD. The FREE version: HD Video Converter on Mac. Additionally, the Mac HD to SD video software provides you with more features to perfect your video. Mac OS X Snow Leopard (version 10.6) is the seventh major release of Mac OS X, Apple's desktop and server operating system. Apple CEO Steve Jobs announced Snow Leopard at WWDC on June 8, 2008, and it was privately demonstrated to developers by Senior Vice President of Software Engineering, Bertrand Serlet. A first public demonstration was given at WWDC 2009 by Serlet and Phil Schiller, Senior Vice President of Worldwide Marketing. Snow Leopard was released on August 28, 2009, and is available as an upgrade for Intel-based Macintosh computers. Single-user licenses and "family pack" licenses for up to five computers are available, and for qualifying Mac computers bought after June 8, 2009, Apple offers a discounted price through their "up to date" program. While the Snow Leopard release was originally described as an upgrade for users of Mac OS X v10.5 "Leopard", the company later said that this will also work for Mac OS X v10.4 "Tiger" users as well. For users of OS X "Tiger", Apple has released the "Mac Box Set", which includes OS X Snow Leopard, iLife '09, and iWork '09. Mac HD video converter supports converting HD videos including m2t, m2ts AVCHD video to general video formats like AVI, MPEG, WMV, MP4, DivX, RM, MOV, FLV. So it can be used like an iPod/iPhone/Apple TV/Xbox/PSP/PS3 video converter for Mac users to convert HD and SD videos to your multimedia devices that support HD or SD videos. 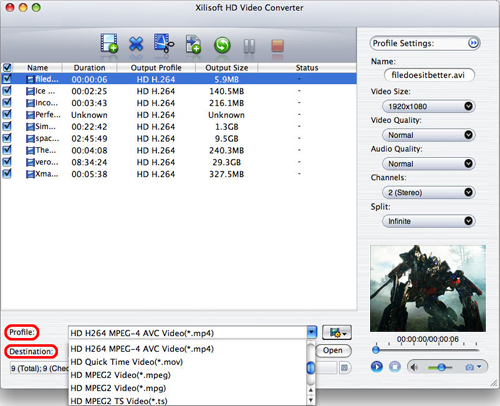 Xilisoft HD Video Converter for Mac makes it possible to watch high definition movies in 720p and 1080p resolutions on your HD video players.